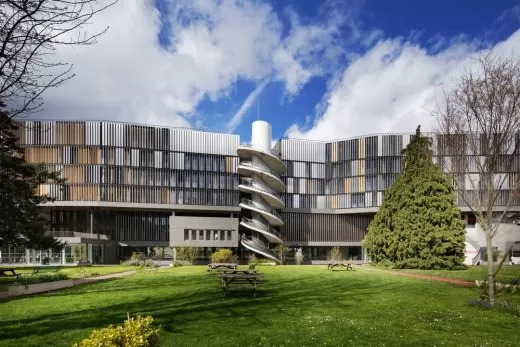 Operation to construct a new 12,500m² building on the JOURDAN CAMPUS site for higher education and research that includes administration, research offices, classrooms, shared lobbies, cafeteria, documentation centre and amphitheatre; a 33-space car park is also provided. 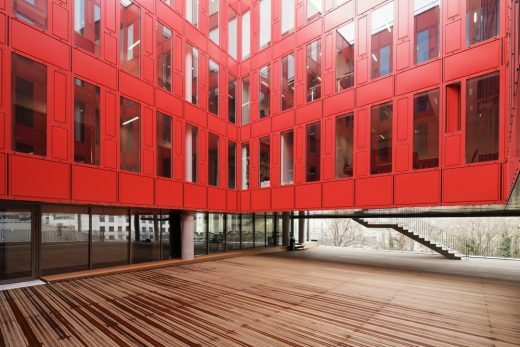 The Ecole Normale Supérieure (ENS) and Paris School of Economics (PSE) that occupy the building propose masters and doctorate programmes in the social sciences: sociology, geography, law, political science and economics. 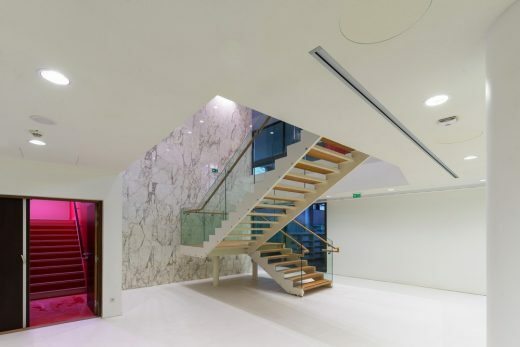 The simple, elegant and contemporary architecture anchors the new building to the city. Attention was given to insert the building into its site. 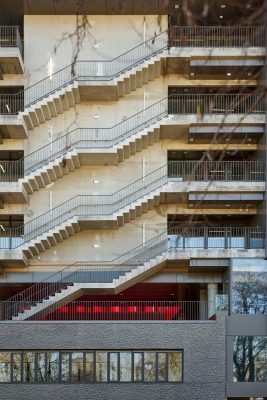 The base of the building accommodates the shared facilities of the two schools: library, amphitheatre, cafeteria and lobbies are readily identified from the gardens and public space. Two levels of the central body accommodate the Masters program and students. 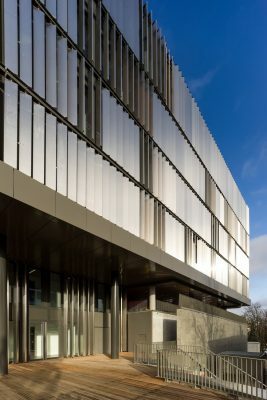 The top four floors are allocated to research offices on a regular construction grid that facilitates their flexibility and potential future layouts for research teams. The broken lines of the facades give oblique views while respecting the imposed alignment. Another objective was to participate in future redevelopment of the block with facilities that respect environmental practice, to give primary importance to the treatment of outdoor spaces. The design intent was a convivial nest bordered by a green belt poised on a base of light. 1- Construct a building that reflects a modern project open to the future, where learning and knowledge of the world find their place. 2- Establish a clear and efficient internal layout that expresses a powerful tool capable of facing time and its era while providing orderly and friendly internal spaces with well-lit circulation. 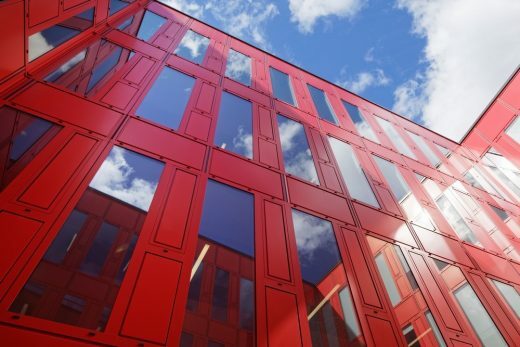 3- Generate construction efficiency through the use of prefabrication and the search for a degree of efficiency in the treatment of its volumes, thus making it possible to use materials of high quality and durability while engaging the project in a social and environmental quality programme. Accordingly, in respect of the brief, the proposal is a solution whose form above all expresses the functional identities and their built implementation. The design concept of the new ENS JOURDAN campus is of knowledge entwined in the midst of trees. The project primarily differentiates its functions, the first step to understand what makes it possible to identify places while managing the different flows. 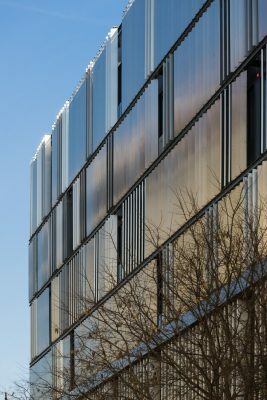 It focuses also on light, or rather on the search for daylight, to provide quality teaching and learning conditions, and to reduce energy consumption. 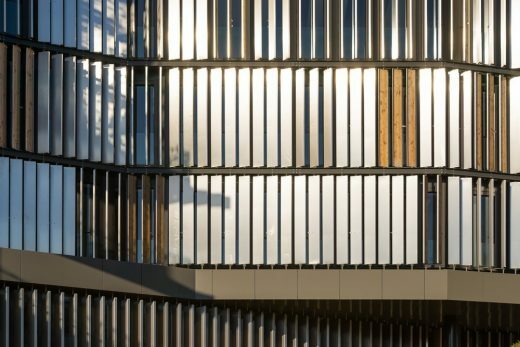 As part of a need for durability, the deliberately limited choice of materials proposed for the facades gives unity to the project. Moreover, the proposal sets out to define a PLACE. A clear coherent complex, a proposal strong enough to be appropriated by users, of which they are proud. Another objective was to participate in future redevelopment of the block with facilities that respect environnemental practice, to give primary importance to the treatment of outdoor spaces. 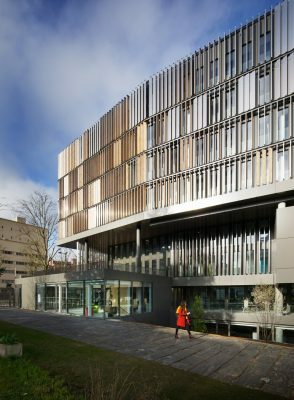 While providing a single building for two schools clearly identified within the same campus, the design intent was a convivial nest bordered by a green belt poised on a base of light. New building repeats proportions and careful attent ion to detailing of glazed corners on existing buildings. 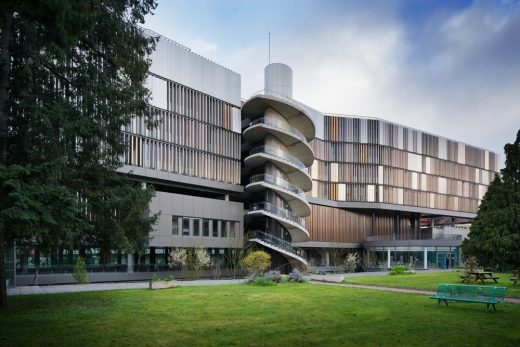 Campus Jourdan is a ‘flagship’ campus designed to accommodate the interfaces between the social sciences and scientific modelling. 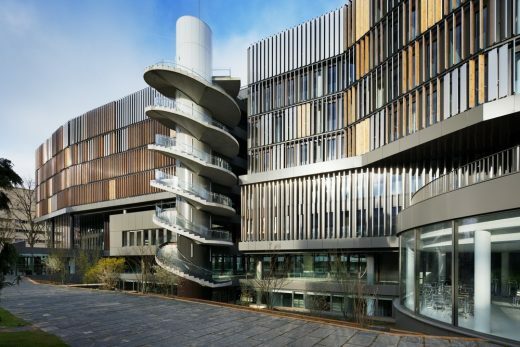 Phased redevelopment of the site serves this purpose mainly through the proposed new building that accommodates the social sciences and geography departments of the ENS and the Paris School of Economics, one of the most important economics research centres in France. The main project challenge is to maintain the ‘spirit of place’, the urban and landscaped balance of the site. – At the functional level, to put in place a powerful rational and evolutive tool that responds to the need for scientific research and high-quality teaching. – At the environmental level, to make energy efficiency an absolute priority by engaging the operation in Haute Qualité Environnementale (HQE) approach. Objectives were to: – build for teaching, research and administration purposes a building that corresponds to the educational and scientific projects and practices of the two institutions: ENS and PSE. – provide quality shared spaces, library, seminar and conference spaces, and a cafeteria. 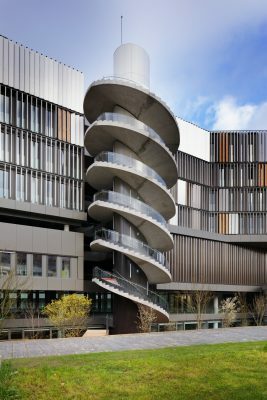 – inscribe within the site while respecting the architectural order, the relationship it maintains with its urban and landscaped environment (proximity to the Cité Universitaire and the Dutch College opposite) and their practices. – Control cost strictly throughout the operation to remain within the client budget. 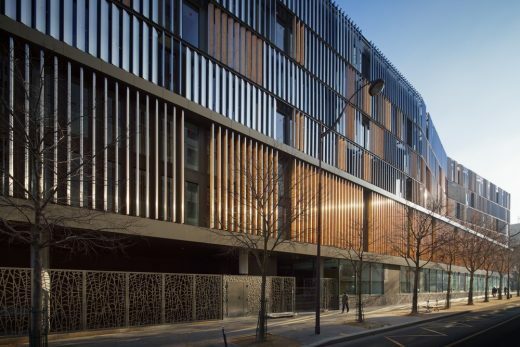 – to the west: participate in the redevelopment of the Rue de la Tombe Issoire by a luminous building that marks its era yet based within the local fabric. – to the east: excavate volumes to bring the Park within the workplace. – to the north: frame the landscape at all points from the internal circulation. – to the south: work the double height volumes to recall the domestic scale of the former school, with a play of light and shadow that makes the boulevard vibrate. Classical architectural composition with three superimposed orders: – attachment to the ground with a rising effect to discover the interior of the Park from the public spaces – a central body punctuated by a light code – attachment to the sky with a broken line to better animate the length of the building. The project respects the brief built area schedule. Different project functions are expressed within specific entities, easily identified by users and therefore readily appropriated while meeting the brief requirements. The different functions are expressed in elevation, from the ground to the sky, yet form a single coherent entity. Each school is legible and identifiable yet forms an entity that exceeds the sum of the two parts. The project is a knowledge lantern that illuminates the park. The project is a beacon that illuminates the boulevard. 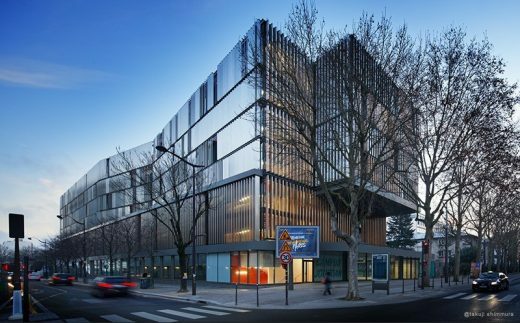 The ENS is located on the south side towards Boulevard Jourdan and the PSE in the north towards the protected green space. The two schools are linked by shared facilities – the library at garden level, the amphitheatre and cafeteria on the ground floor. The library is immediately identified when seen from the main lobby, with independent access, and embedded in the ground to have exceptional acoustic performance in relation to the movement of students and researchers. In reference to the old library, it is located in front of the central garden to provide simultaneously calm, concentration and daydreams. In its centre, it provides shelves and consultation spaces abundantly daylit by a skylight in the form of inverted half-shells. 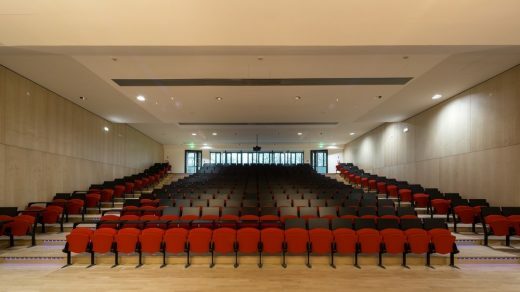 The amphitheatre is located opposite the main lobby, daylit from the north by a large bay window that stages the protected green space in extension of its terraces. In time, it can be extended by an amphitheatre of outdoor greenery to link the building to its recovered plot. The cafeteria is located at the junction between the new building and the former central pavilion, oriented to the south and deep behind the Park to facilitate its appropriation. In extension, a stair leads to the timber terrace above. 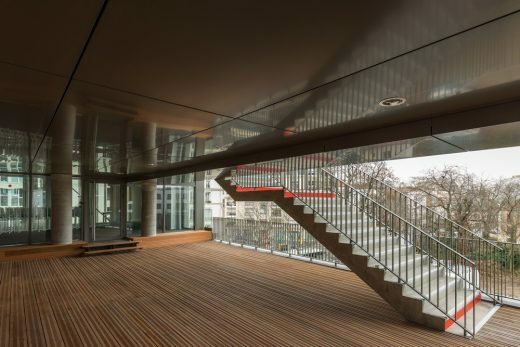 Another stair then leads to the outside Grand Ponton on level 3 (amphitheatre roof) perched overhead to provide users shade, coolness and shelter. – level 2: ENS Masters II in the south, PSE Masters II in the north. – level 3: ENS Masters I in the south, PSE Masters I in the north. The Masters are oriented to the west along Rue de la Tombe Issoire in the shadow of the proposed 10-storey residential college opposite. 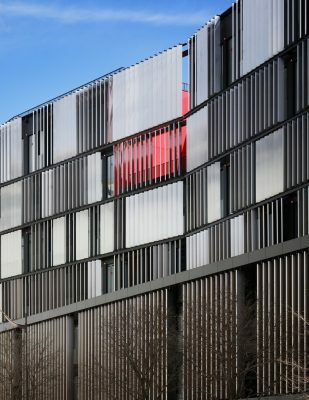 The broken lines in facade give students oblique views while respecting the imposed alignment. On the Masters level, circulations snake up into a belvedere overlooking the Park. Conversely from the Park, the movement of student activity on the belvedere forms a lively and permanently animated theatrical backdrop that reinforces the sense of belonging and unity with the campus. They are juxtaposed to one another to ensure future flexibility in their use. 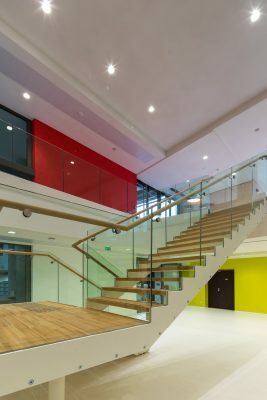 On the east, two student social facilities (ENS and PSE) located on the first floor at the interface of the lobbies and the Masters, alongside the ‘student deck’ on the balcony over the park, form colourful lanterns on festive occasions. They have independent access from within the campus and accordingly can be used outside school hours without detriment to security. Levels 3, 4, 5 and 6 accommodate research offices on a regular construction grid that facilitates flexibility and potential future layouts for research teams. Maximum flexibility has been given to the research offices with service areas (toilets, ducts and plant rooms, gardens and daylit corridors…) located in the centre of the building with rooms in elevation on the same layout and partition grids. The PSE computer centre is located at the interface of the research floors in the centre of the institution for easy access and to limit the length of cable runs. The rooms are grouped independent from public circulation. PSE student administration is located on the ground floor to give students easy access especially during enrolment. Corridors are designed to also serve as student waiting areas. In addition, particular attention is given to daylight in circulations, developed into a belvedere overlooking the environment to frame the sky, trees and landscape. Thus, the general layout is designed to facilitate the use of rooms for different activities while giving coherence to zones and tranquillity to teaching areas. The domestic scale of the proposed spaces gives a poetic charge to the complex while underlining functional discipline. Above all it is a COHERENT, STRUCTURED and FUNCTIONAL complex. 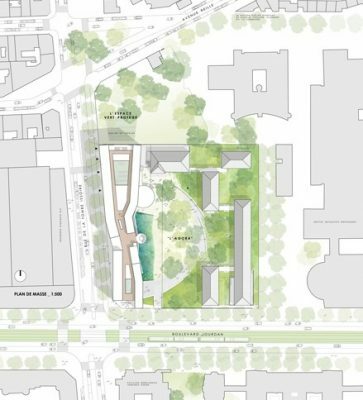 Beyond the garden, the project creates natural extensions between the forest-like natural space of Avenue Reille and the green axis of Cité Universitaire. Through a multiplication of related planted environments and individual spaces, the project provides diverse environments within a single place. By creating a living, exchange and strolling place in the form of gardens, forecourt and agora as a campus. Anchored by three major spaces (the Gardens, the Agora, the Garden of Knowledge and its filtering terraces) the project adapts to the diversity of its forms and functions. Its configuration provides, on its planted banks and in the centre of its Agora, with a variety of scales and nature places equipped and adapted to individual or collective student life (sun, shade, coolness, heat, mineral, vegetal, furniture…). 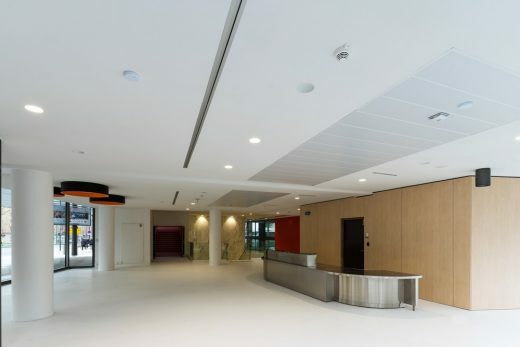 Like the agora on campus, the central space is the link between the Ecole Nationale Supérieure and future redevelopment projects of the Institut de l’Environnement and Institut National de Recherche en Informatique et Automatique (INRIA) – National Institute for Research in Computer Science and Automation. Campus living space, this vast courtyard is shaded by robinia planted in clumps of 3-5 trees, a sturdy aerial and lightweight species that provides wispy shade. The elliptical shape energises and reinforces the Agora centrality. This geometry has the advantage of bringing together the disparate Campus entities. Meet under the light shade of the robinia to study, exchange, discuss or attend outdoor events (concerts, debates, shows…). The low height peripheral wall, on which supports the planted embankment of ground cover gardens, serves as full-length seating. Benches and chairs (timber and steel) clustered to form a living area are positioned between the trunks of the clumps to complete the seating provision. – a central area backed and protected by planted shallow embankments – a succession of micro-filtering terraces to enable alternative rainwater management – an embedded Garden of Knowledge linked to the library. The preservation and development of depths of field and open views of the city are essential for the reintegration of the site within the city and its reconciliation with the Jourdan Campus neighbourhood. 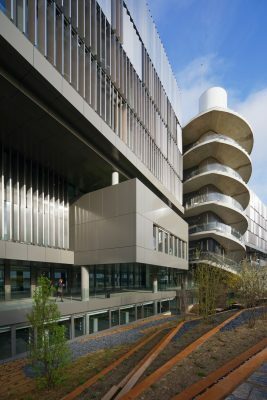 To improve and stabilise storm water quality, to integrate an aquatic landscaped space and educate students on alternative techniques, the team wanted to install filtering terraces to create a ‘marsh’ based on the absorption of pollution by plants and phytoremediation. Open onto the library, this unique space sharpens the interest of readers and promotes education around staged urban water. The presence of water in the Garden of Knowledge lets in light during winter due to the mirror effects produced by the groundwater on the terraces. Due to the diffusion of moisture into the air, during summer the terraces attenuate the contrast and make the atmosphere more comfortable and relaxing. During the project, consciousness and the water cycle should be restored and the resource developed to contribute once again to comfort within the city, to its climate and biodiversity. The natural ecosystem of filtering terraces was implemented on this premise and commitment. Filtering terraces are planted with a mixture of grasses, flowering perennials and hygrophilous plants. There is no need for watering since plants tolerate drought periods. The terrace ecosystem depends on the recovery, storage and filtration of roof water. 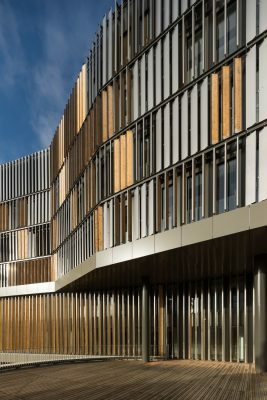 Part of the Nature en Ville and urban biodiversity approach, the Jourdan Campus Garden links planting and nature extensions with the green axis and the forest-like natural space of Avenue Reille. The landscape project is based on the planting of clumps of pseudo-acacia ‘frisia’ robinia known for its slight shade and luminous foliage. The garden planting system, with densification in the west and diffuse implantation in the east, improves the bioclimatic performance of the buildings. Robinia clumps filter sun rays from the west and leave openings and the passage of light onto the east elevations. These clumps also provide shade to the Agora, a place to stroll and a cool central place to gather where it is pleasant to meet to discuss or revise. To integrate landscapes and preserve the wooded heritage, existing trees within the ground cover gardens are preserved. However, for phytosanitary reasons, it is likely that certain subjects be cut down and replaced. Shallow embankments that protect and surround the central Agora are planted with a range of ground cover plants such as climbing bugle, periwinkles, ivies, windflowers, woodruffs and hyacinths that create a succession of planted atmospheres throughout the seasons. Simple to maintain, during spring this cool undergrowth blooms into a multitude of fragrant flowers. Large natural stone slabs with planted joints provide pedestrian access between buildings. Its layout is defined to give all users use of the outdoor spaces. Slabs with narrow joints facilitate access for the disabled. The Garden project is part of a sustainable development approach, both in its design and layout as well as its everyday management which uses these techniques in an attractive and educational setting. Highly frequented spaces such as forecourts and grasspavements designed with a diversified range of sturdy droughtresistant species. To maintain environments and anticipate plant dynamics, the specific design of a ‘natural urban garden’ includes implementation of a suitable management plan. 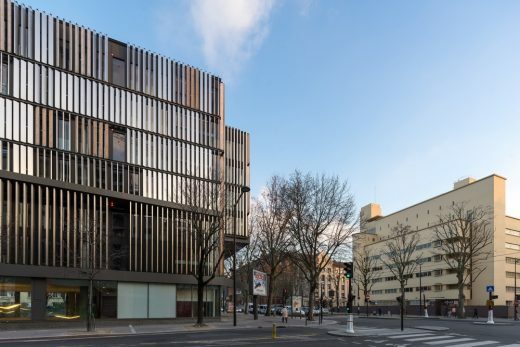 To reinforce this natural identity and to associate with conviction the idea of nature within the modernity of the city – structures, fences and furniture use natural materials combining steel and timber with contemporary applications. Cool retaining garden walls made of Corten steel, the most environmentally friendly steel due to its composition, production method and durability. Reconstitution of soils, restoration of plant dynamics and natural environments, water cycle and cooling of the urban atmosphere developments all contribute to the composition of a performant modern urban space, the production of an alternative outgoing campus image that contributes to ENS and PES influence, that demonstrates their commitment to future generations. A showcase of knowledge with an international reputation now occupies the corner of Boulevard Jourdan and Rue de la Tombe-Issoire in the south of Paris. 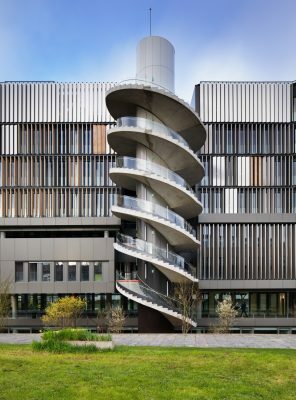 Designed by Thierry Van de Wyngaert and Véronique Fiegel, the Jourdan Campus for higher education and research unites the Ecole Normale Supérieure and the Paris School of Economics. 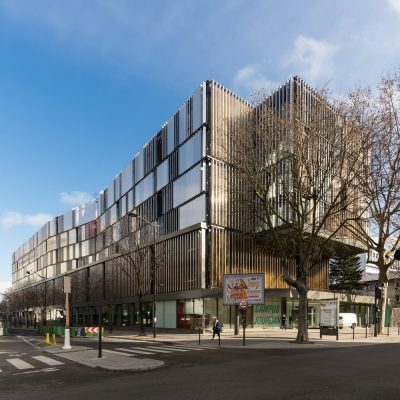 Spread over 12,500 square metres, located opposite the Cité Universitaire and the Dutch Residential College designed by Willem Marinus Dudok in 1928, the Campus buildings redevelop the Paris periphery in the wake of the tramway. Thierry Van de Wyngaert and Véronique Feigel designed a bar that folds, sways and rises to better integrate into its site. Each entity – the ENS as well as the PSE – benefits from its own wing. Both are physically separated by a crevasse marked by a succession of generous terraces and the central sculptural staircase visible from outside which connects them. 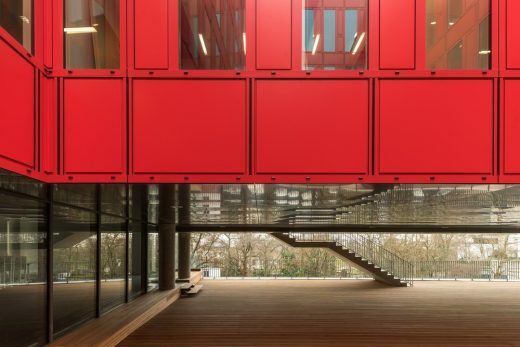 A central axis – the Ernests jetty – connects the reception lobbies of each school. The building has been raised to give total transparency on the ground floor. 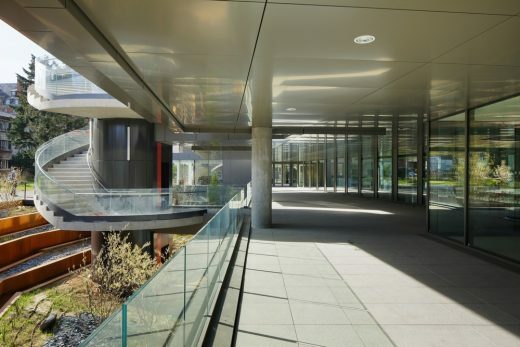 The main entrance through the fully glazed reception lobby, located at the corner of Boulevard Jourdan, serves the common areas of the two institutions – the library on the first basement level, the cafeteria, the 300-seat amphitheatre. The first two floors join classrooms and meeting rooms for the Master I and II programmes. Research offices of both schools occupy the upper floors. 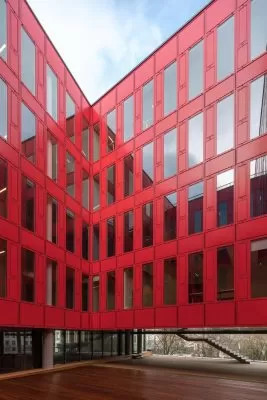 Large vertical manually adjustable brise-soleils – polished stainless steel on one side, larch wood on the other – protect full-height floor to ceiling windows, provide thermal comfort and – according to their orientation – give a vibration to the facade. Exterior spaces are designed as a planted agora that follows the topography of the site. The original central garden has been preserved. A converted courtyard has been excavated to give daylight and a view to the library. The architects developed a project with steep wetland gardens. The succession of filtering micro-terraces creates a smooth transition between the central garden and the library below.